What is a Leadership Consultant? Leadership Consultants are representatives of the sorority who work with collegiate chapters throughout the academic year in areas such as officer training, recruitment, and leadership. At the same time, Leadership Consultants are cultivating valuable professional skills that will continue to serve them after their year of travel. 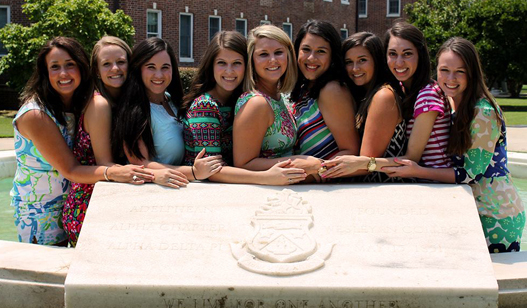 Is your chapter hosting a consultant? Do you want more information on becoming a consultant? Do you still have questions? Click to read the official Guide to the LC Program! To apply to be a 2019-2020 Leadership Consultant, click here. Applications are due November 1st. For a full description of the Leadership Consultant role, click here. Please do not ask a family member to write a recommendation. Also, due to her involvement in the interview process, your District Team Director should not be asked to submit a recommendation. You will be asked to supply the name and email address of each individual writing you a recommendation on the application form. These individuals will be emailed asking them to submit their recommendation. Please note, only online submissions via the application website will be accepted. Even if you are still unsure about completing the application, it is best practice to go ahead and ask for letters of recommendation to be submitted on your behalf. You can enter the names and contact information once you have started your application. For more information e-mail Jen Dickinson at jdickinson@alphadeltapi.com.